Almost every Sunday for the last year, my oldest has come over for dinner and a movie night. He's been out of the house for a long time now, so his decision to spend this time with us is very special. My husband, my son and I rotate through choosing the movie to watch from Netflix or iTunes offerings. Every once and awhile we head out to the cinema for one that needs the big screen and sound system. What to cook each time is always a puzzle. I want to use this time to try new things and to create a true family dinner. I also don't want to spend a lot of time in the kitchen once he arrives - so it needs to be prepped ahead or cooked in the slow cooker. Usually the extras such as bread and dessert are purchased, but I like the main dish to be homemade. This week I decided it was time to find a new slow cooker recipe. The three of us were struggling to decide whether to watch a movie here or head out to the cinema for a mid-afternoon show, so I needed the flexibility of food that would be ready when we walked in the door. This recipe from FoodandWine.com caught my eye. 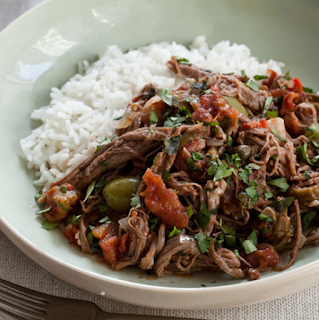 It's inspired by a Cuban dish called Ropa Vieja. The 2 pounds of flank steak proved to be expensive, but there were a decent amount of leftovers even though 3 or the 4 eating were men. The picture shows it with rice, but as the recipe says you can serve it instead with warm tortillas and this is the option I took. I bought the smallest size and heated them in the oven wrapped in foil. I am also not a fan of green bell peppers. So instead of a red and green pepper, used a red and yellow one. Up to you. The meat mixture was very wet, so next time I'll be draining the diced tomatoes and skipping the 1/2 cup water. 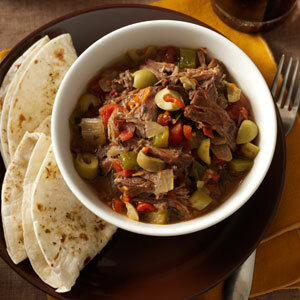 I placed the meat mixture in small bowls that I placed on larger dinner plates along with the tortillas and side dishes. We all assembled our own little wraps as we ate. I love this style of serving where you get to dive in and create. This isn't spicy, so if you want more zip I would increase the number of jalapenos or add a dash of your favourite hot sauce. There are tons of varied recipes for Ropa Vieja. I may just have to try a few others and compare. Small tortillas warmed. Can serve with rice if you prefer. Season the flank steak with salt and pepper. In a slow cooker, combine the diced tomatoes and their juices with the water, bell peppers, onion, garlic, jalapeño, oregano, cumin and bay leaf. Add the flank steak, cover and cook on high for 5 hours, until the meat is very tender. Transfer the meat to a cutting board and let rest for 10 minutes. Discard the bay leaf. Stir the olives, capers and 1 tablespoon of the cilantro into the sauce. 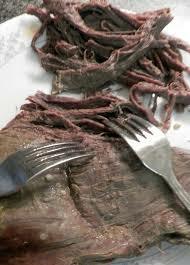 Using 2 forks, shred the meat. Return the meat to the sauce to warm through. Season the sauce with salt and pepper. Spoon the meat and sauce into bowls, sprinkle with the remaining 2 tablespoons of cilantro and serve with warm tortillas (or on rice).